There was some recent buzz on diyaudio.com about a gadget called the REV33 (www.rev33.com) that goes between your headphones and the headphone amp, claimed by its sellers to reduce distortion, noise, and listener fatigue. Its promotion was accompanied by lots of testimonials and elaborate graphic design, and almost zero technical backup. They claim six patents pending, and in correspondence, one of the principals of the company also stated that the Patent Office examiners had allowed their claims. This seemed a bit odd since there were no published applications (applications are published 18 months after submission, and generally precede examination) that we could find. This reminded me greatly of a device with similar claims, the Synergistic Research HOT, which on disassembly and measurement turned out to do… nothing. So I must admit approaching this with a definite air of skepticism. Since I have a reputation as someone intolerant of snake oil in audio, and because my buddy Steve Eddy (always the diplomat) had already pissed the REV33 guys off and my name was linked to his, I had my always-helpful wife order one for me, using the funds Steve raised (and my deepest thanks to everyone who chipped in). The REV33 comes in several flavors, supposedly “tuned” to different models of headphones, and likely with scaled impedances. The recommended model for my headphones was the “Yellow”. It arrived expeditiously, packed in foam, and looking very professionally made. More about the construction later in the Teardown section. My test setup: for impedance measurements, a CLIO Pocket (a wonderfully handy device); for frequency response, distortion, and crosstalk, I used an M-Audio Delta 192 soundcard (24/192, balanced out and in) or a Focusrite Scarlett 2i2, with software from Rightmark, ARTA, and Virtins. Headphone amp was a home-made unit based on an old LM1875 chip amp. Where possible, I crosschecked measurements using different platforms. 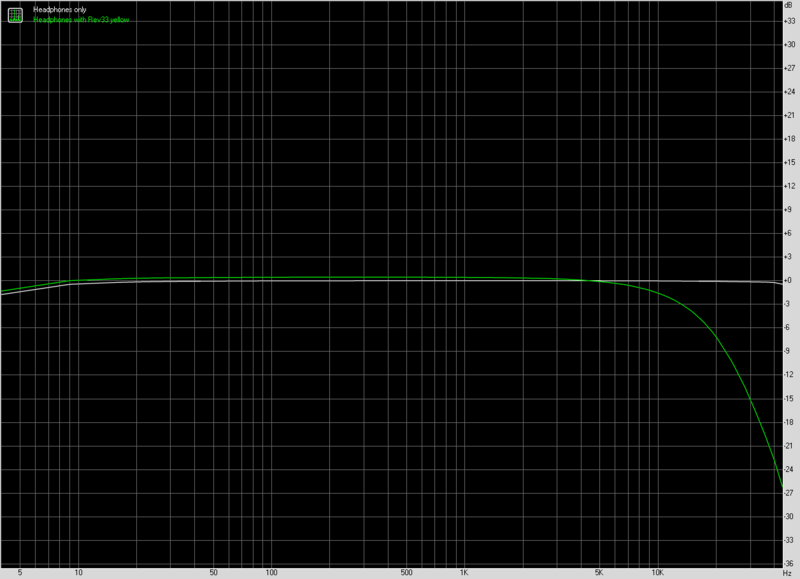 The impedance is roughly 32R as expected, with an HF rise to about 36R5 at 20kHz, due to the voice coil inductance. 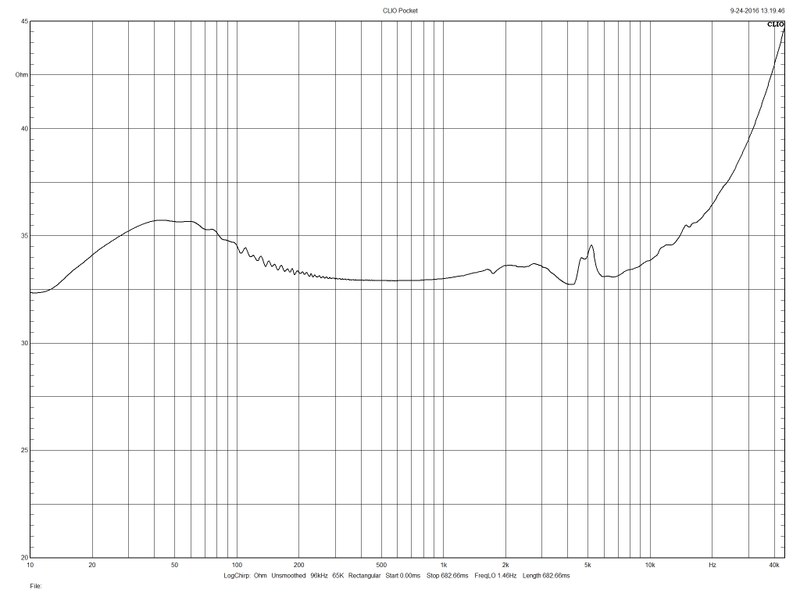 I then measured the electrical frequency response using a 32R dummy load, a resistance close to the general impedance of the headphones. 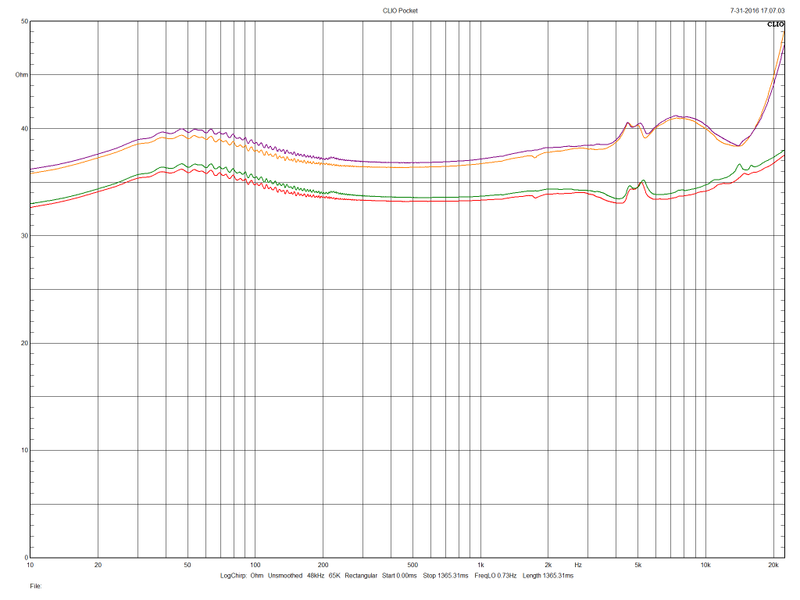 This graph shows the difference in the voltage delivered to the load, with and without the REV33 Yellow inserted. The response looks much like a 4th order lowpass filter at about 10kHz, doesn’t it? 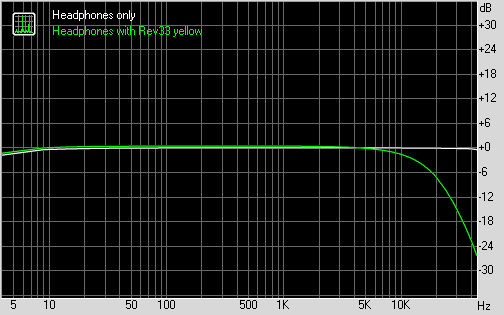 The slight HF rise in headphone impedance compared to the test resistor will reduce the attenuation slightly at 20kHz, but it will still be close. Well, this is a good start- unlike the Synergistic HOT, this gadget actually has some electrical function! More measurements in my next post…. Feel free to comment at diyaudio.com.